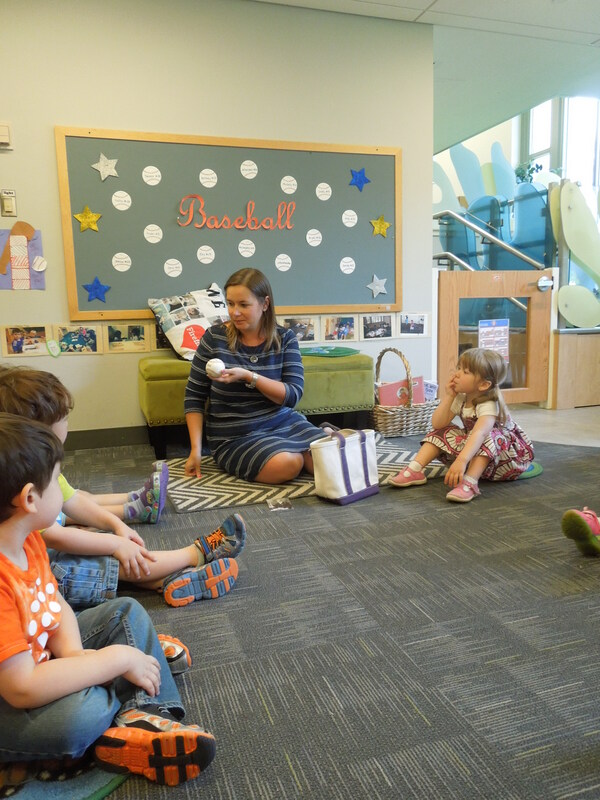 This blog is authored by our Director of Infant and Toddler Programs, Melody Passemante Powell. Melody graduated from James Madison University with a BS in Early Childhood Education and earned her MEd in Education Management from Strayer University. 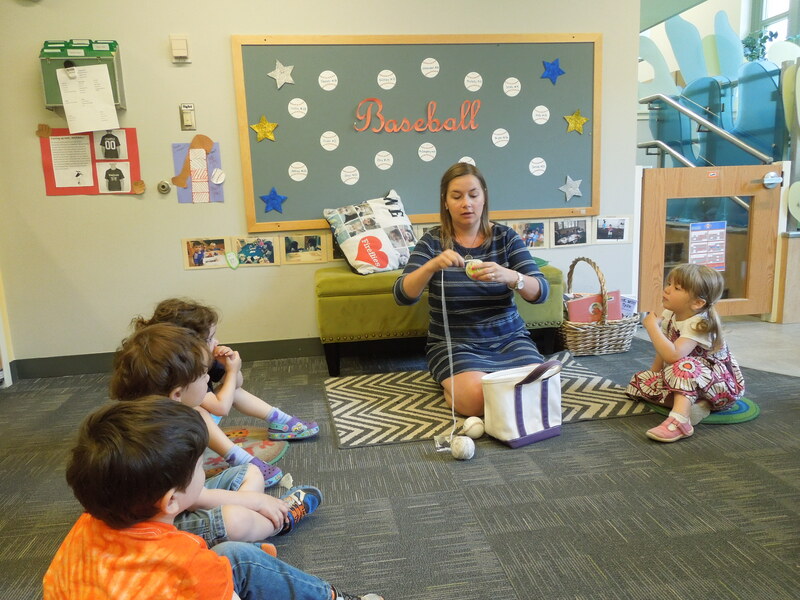 She has been working with and for young children for nearly two decades in a variety of roles. In her down time, she enjoys having fun with her two-year-old daughter, wife, and dog Jack. TRIGGER WARNING: This blog explores the ways in which young children process death and how adults can support them through such a difficult time. The author reflects on her own experience with the death of her mother at a young age and may be triggering to some. As the philosopher Heraclitus so aptly stated, change is the only constant. Some changes are simple and easy to adapt to, while others might be more complex and can evoke mixed emotions. As our previous blog explored, moving to a new house, welcoming a new sibling, or starting at a new school are changes that would likely cause feelings of nervousness mixed with excitement. Then there are other changes that are incredibly hard and complicated to adapt to, like death. Unlike many other changes in life, death is one change that is often very hard to talk about because it is such a big and complex concept that even many adults have a hard time processing. It can be even more daunting to be tasked with talking to children about death, especially when we ourselves may be dealing with the situation, and potentially grieving at the same time. I have always felt drawn to this topic because I have a unique perspective as I lost someone very close to me when I was a young child. I went back and forth about sharing my personal experience, not because I have trouble sharing, but because I worried about making others uncomfortable. As I processed these feelings, I realized they were connected to a norm in my culture: to avoid making others feel sad and uncomfortable. I decided that sharing my experience felt relevant and important. Although like most stories associated with death, it may be hard to read. When I was three, my mother died. The situation was even more complicated by the fact that my mother committed suicide. On the day that it happened I had been to play therapy in the morning, where my therapist had told me my mother might try to kill herself again. Unfortunately my mother had tried before and I was aware since I was in the house. On the day my mother died, my Grandma had been tasked with telling me what had happened. After school my Grandma held me on her lap and asked if I had remembered my therapist telling me my mother might try to kill herself again. She let me know that sadly she did today and she died. My Grandma told me that my mother loved me very much, but that she was very sick. She stressed that she had needed grownup help but sadly even that wasn’t enough. My Grandma answered all my questions succinctly without elaboration and took her lead from me. Later at home in a room of adults I said something to the effect of, “I am sad that mommy killed herself.” My family replied that they were all sad too. I was given space to process and while I do recall being sad, I also remember having a pretty solid understanding that this was permanent and I would not be seeing my mother anymore, likely because this is what I was told. I wasn’t confused because even though it was a very complex concept to grasp, I was given honest, age-appropriate answers about what was going on. My questions were welcomed and I was given a safe space to talk through anything I was feeling or wondering about. I recognize that my experience is not the same as any other child going through the difficult change of losing someone close to them. Death and grief are deeply personal topics, often connected to our cultures and belief systems. Even within cultures, no two people experience death and grief in the exact same ways. So how do you talk to children about death? Of course it will depend on your personal beliefs, but here are some tips based on my experience, what we know about child development and how young children understand the world around them. These phrases would be used within a larger, ongoing conversation, but might be helpful as a starting point for honest, age appropriate communication. 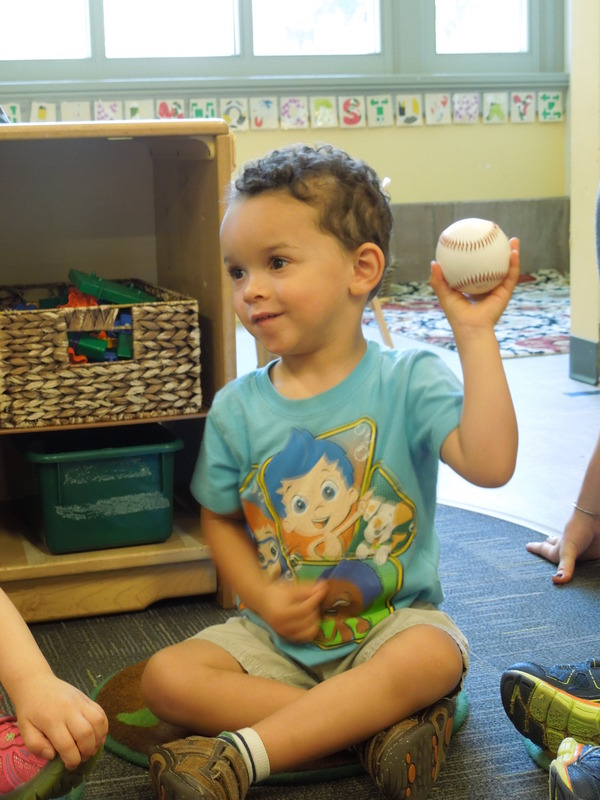 Young children are better able to understand complex topics when they are able to make personal connections to things in their life. It can be helpful to reference something they are already familiar with to make a comparison such as a plant that was old and died, a pet that died, or a character in a book or movie. Children are curious by nature, working to understand the world around them. Young children think in concrete terms, so it is best to use clear language and avoid euphemisms that may cause confusion. Phrases like “her body stopped working” or for a child a little older, “her heart stopped pumping blood through her body to keep her alive” are concrete and honest. Phrases like “he is sleeping forever” and “he is up in the clouds now” can cause confusion for children because they will take these literally. Children might worry they may never wake up if they go to sleep. It is normal that children might become nervous or fearful in general when learning about and processing a complex topic like death. When answering questions, be honest, but avoid elaborating unnecessarily. We might think that children need lots of information or we are being dishonest by withholding, but in this case sometime less is more. Everyone grieves in different ways, and talking about your feelings when you are grieving may not be the way you process your emotions, but talking with young children about our feelings is critical for young children. A good rule of thumb is to find times to simply narrate out loud about your feelings. For example, “I am feeling sad about our dog Francis dying. Sometimes when I feel sad, I cry with someone. Other times I just want to be alone.” Mentioning that people grieve in different ways, and even the same person can work through grief in a variety of ways helps children feel safe to feel whatever it is they might be feeling, and safe to talk about those feelings if they wish to. Although it can be difficult at times, not saying anything sends a powerful message to young children that these topics are taboo, and not to be discussed. over time children begin to make their own assumptions about death and grieving, which may or may not be true. Children as young as infants use social referencing, looking to those they trust in uncertain situations to decide how to act and feel. Showing children that having feelings is a normal, human process, is incredibly important. Some cultures are often taught to suppress emotions, and many children think that crying or feeling sad is not okay, when actually these feelings and expressions are completely normal and healthy ways of coping. Validation goes hand in hand with talking about our own feelings. When a child has been sent the message from the important adults in his or her life that grieving, and expressing feelings is okay, they will likely feel safe to express their own feelings. There are no right or wrong feelings and there are no right or wrong ways to process complex situations like death. Remind yourself and your child that grief is a non-linear process. Some days we might feel okay, even happy, and other days we might find it unmanageable to get out of bed. None of this is easy, especially if you have to talk with a young child when you yourself might be grieving. My personal silver lining from my experience with my mother’s death, is that I am able to remember how I felt when I was younger, and to be able to say that when given honest information, and a safe supportive space to work through their feelings, young children can be quite capable of processing big changes like death. Of course as an adult dealing with these topics when we ourselves are stricken with grief is easier said than done. Remember that you are not alone in dealing with this and there are lots of resources out there to use as support. 64 Children’s Book to Talk about Death and Grief from What’s Your Grief? In a Nutshell by Joseph Anthony – This book is about the life of a tree, and the ways it changes, grows and impacts the nature and earth around it, even after it grows old and dies. This book is more abstract and does not deal with the death of a person or a pet. It is a good conversation starter, and a good reference point to look back to when the time comes that you do need to talk about the death of someone or something close to you and your child. The images are beautiful and very eye catching. No Matter What by Debi Mori – My daughter loves this book as well. This is great book to reinforce that our love for our children persists, no matter what. Dealing with death and loss is hard, and it is important that children are sent the message that they are safe and loved even when things are sad, scary, and confusing. This week we are featuring Meg McDonald. 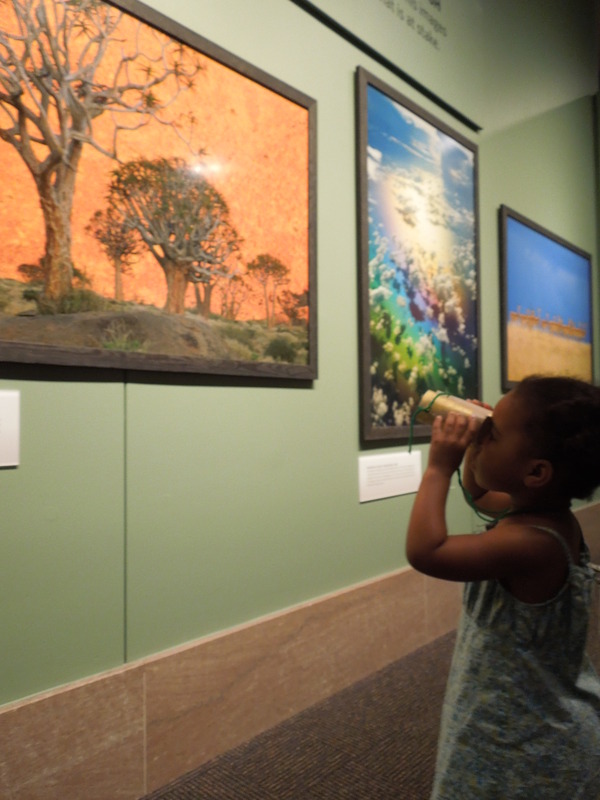 Her toddler classroom was learning about safari’s and decided to go on one in the museum. Below you will find a reflection from Meg and images from her lesson. 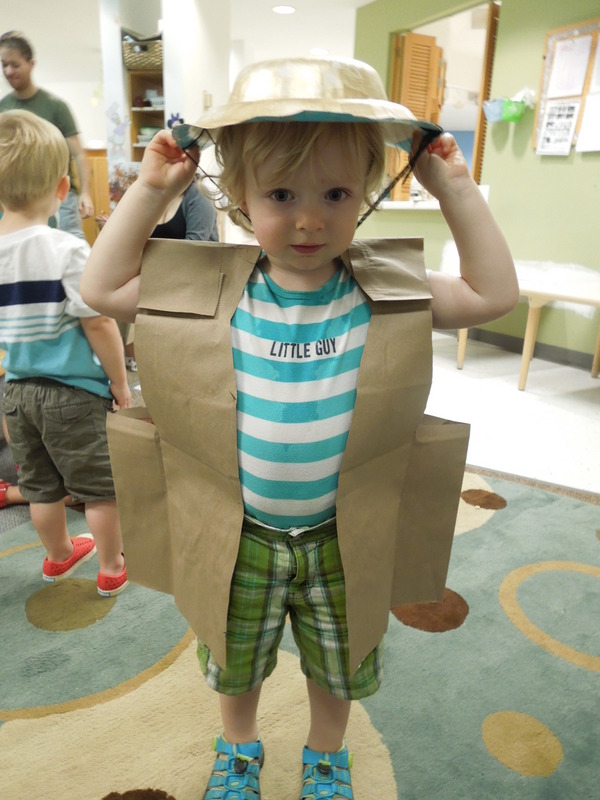 We had been studying jungle animals and this week we focused on going on a safari. We began by discussing the items we might need to have a successful safari. We decided on binoculars, safari hats and vests. Throughout the week we spent time creating these items so everyone could have them for our safari. The day of the lesson each child was decked out in the vest, hat, and binoculars and given a wooden puzzle piece of a jungle animal. 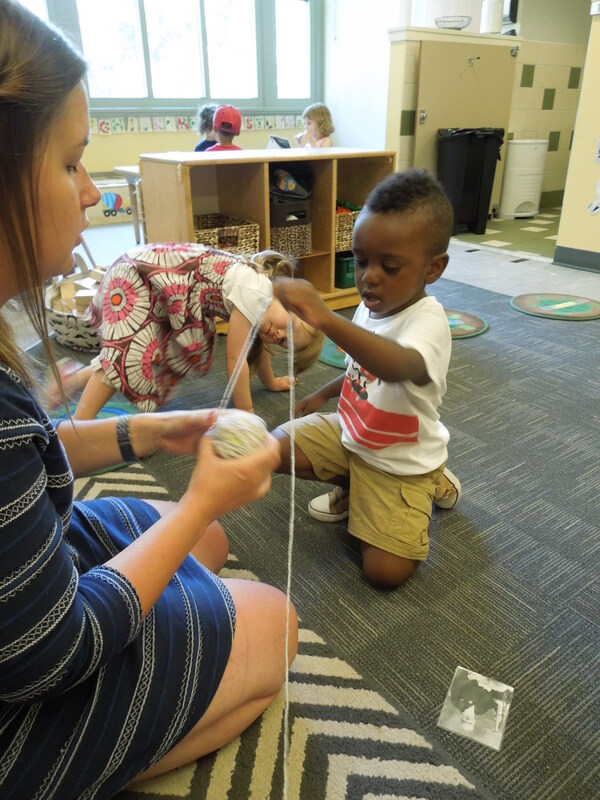 It provided the children with something tangible to hold while we read Rumble in the Jungle by Giles Andeae and took our safari through the exhibit. 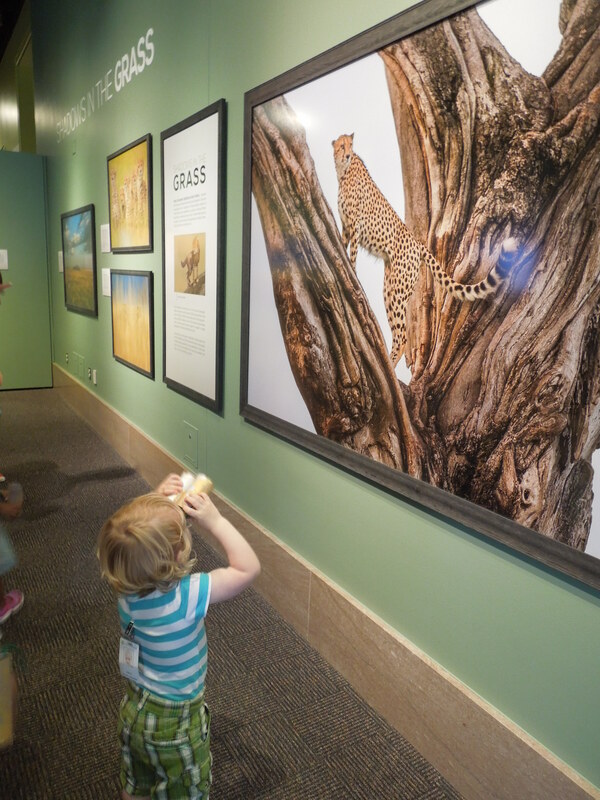 I wanted the children to gain some understanding of the natural habitat of some of their favorite animals and how we can observe them during a safari. Many books and movies mis-represent the habitats of these animals and I wanted to provide them with authentic information and exploration. 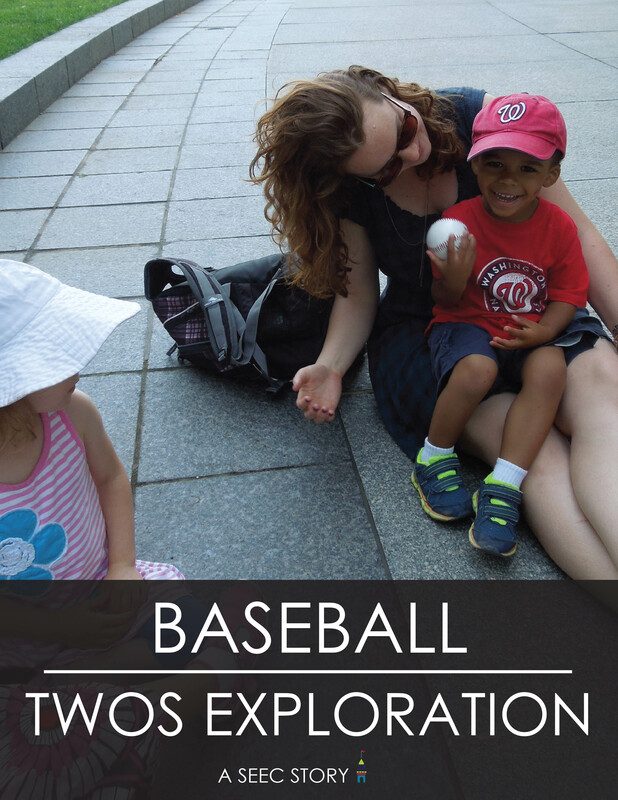 I also wanted to provide them with authentic and exploration. I also wanted them to have practice with matching through the puzzle pieces and photographs. I feel that the most important measure of success is if the children enjoyed what they were experiencing and in this case they definitely did. They got very excited when they found their specific animals and as well as all the animals that we had been learning about previously. They also really liked the photographs and even asked to go back and see them again. Instead of giving them the wooden animals I would have given them a small photo that had a more realistic representation of the animal. I think that would have made a more concrete connection to the photo exhibit. 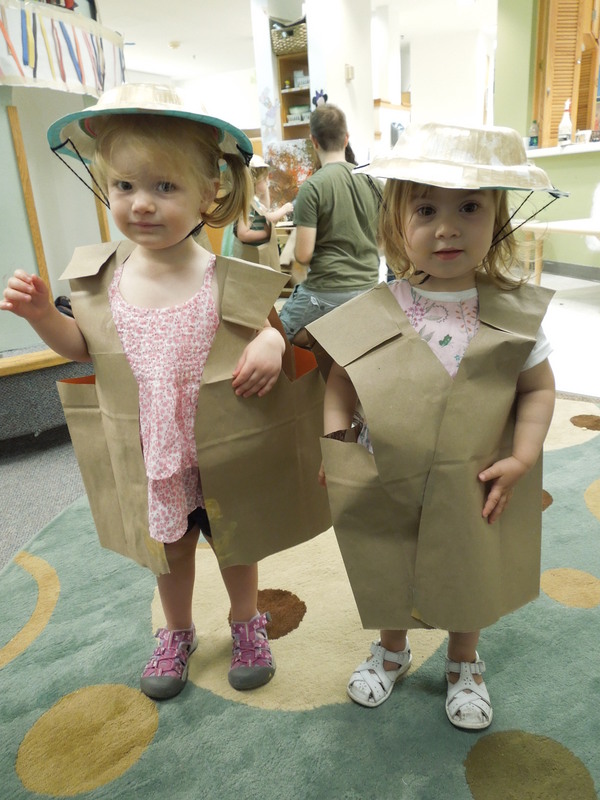 Here are a few images from their safari: Earlier in the week the group discussed the type of gear they might need for a safari and worked on making their own for the museum safari. The group got all dressed up and then headed straight to the Into Africa exhibit at National Museum of Natural History. Meg had the group gather at the front of the exhibit. She passed out different animals found in Africa and invited the children to let her know when they saw the same animal in her book: Rumble in the Jungle by Giles Andeae. 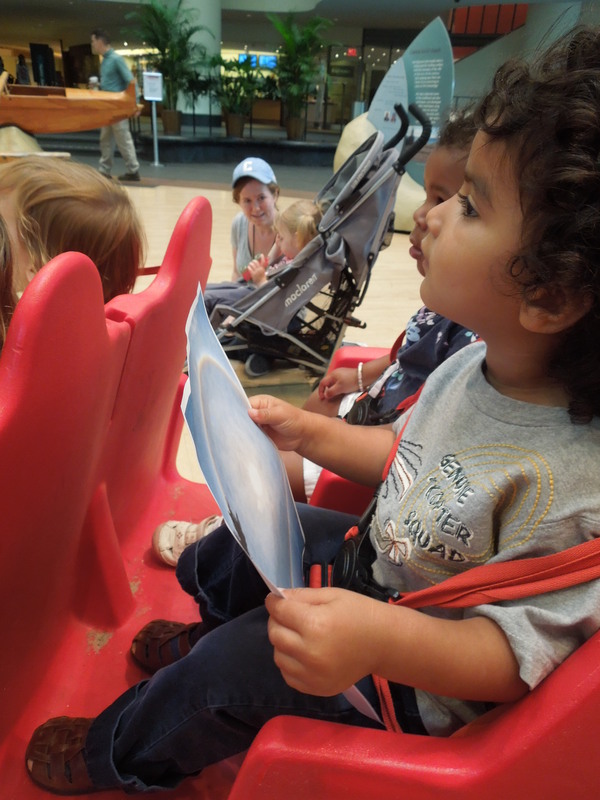 They stayed very focused and attentive through the book, carefully watching for their animal to reveal itself. Some of the children worked together to help identify the animals of the different group. Then it was time to head out on their safari. 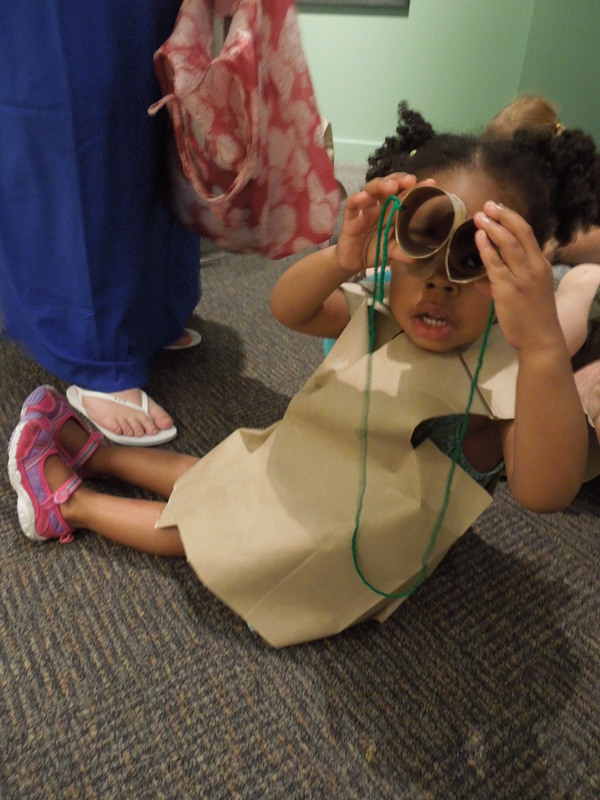 The binocular encourage lots of careful looking and sparked many conversations about the different animals. 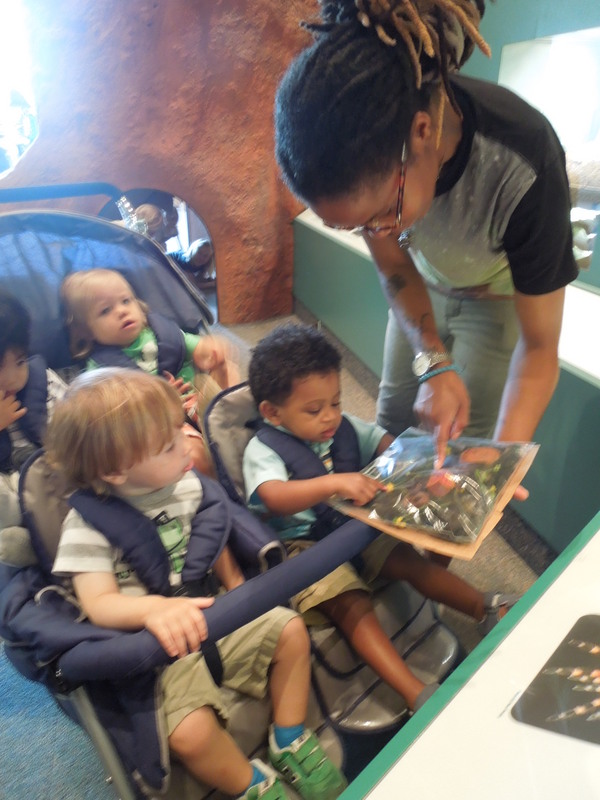 This class had a wonderful time learning about safaris! Be sure to check back for our Teacher Feature next week! This week we are featuring Brittany Brown. 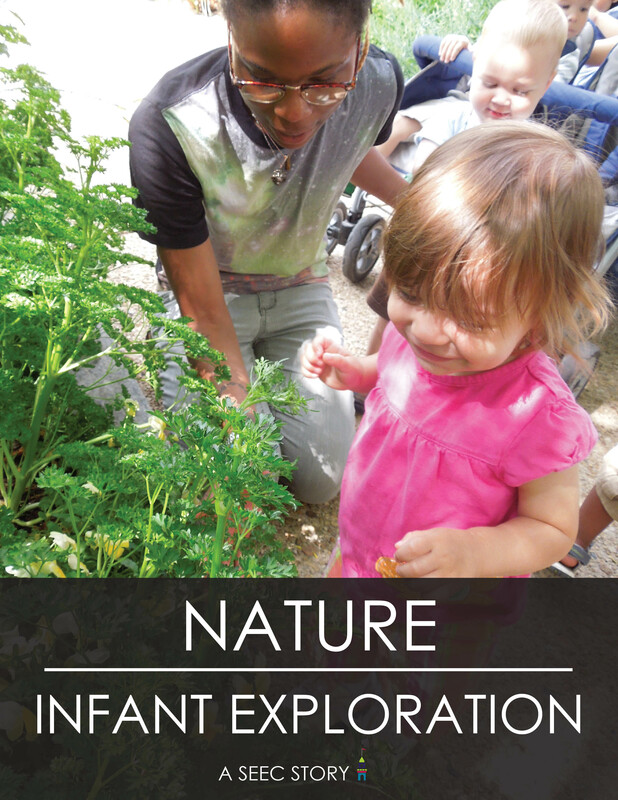 Her older infant classroom decided to spend a day doing a survey exploration of nature. 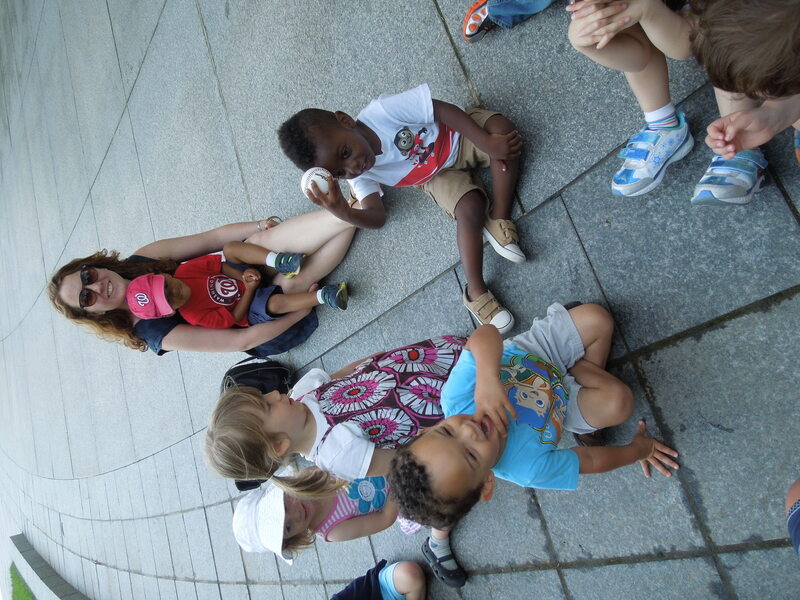 She wanted to introduce the group to the different aspects of nature to see what they were most interested in exploring. Below you will find a reflection from Brittany and images from her lesson on nature. We spent the day exploring nature and the environment around us. I wanted my students to have a better understanding of their environment. I noticed that the children were becoming increasingly interested in exploring the natural world they encounter every day and thought it would be an excellent topic for our group to focus on. 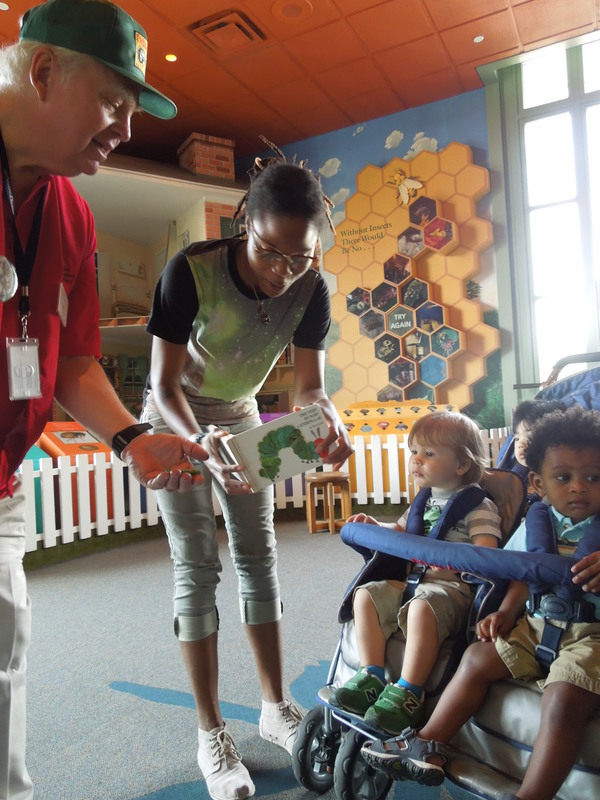 I wanted the lesson to be as hands on as possible, and to teach them that it’s okay to interact with the different things you find (bugs, dirt, flowers, trees, grass). I tried to focus on nature in a more broad terms to start because I wanted to see which aspects in particular caught their interest. We could then move to doing a more in depth study on those topics later in the week. 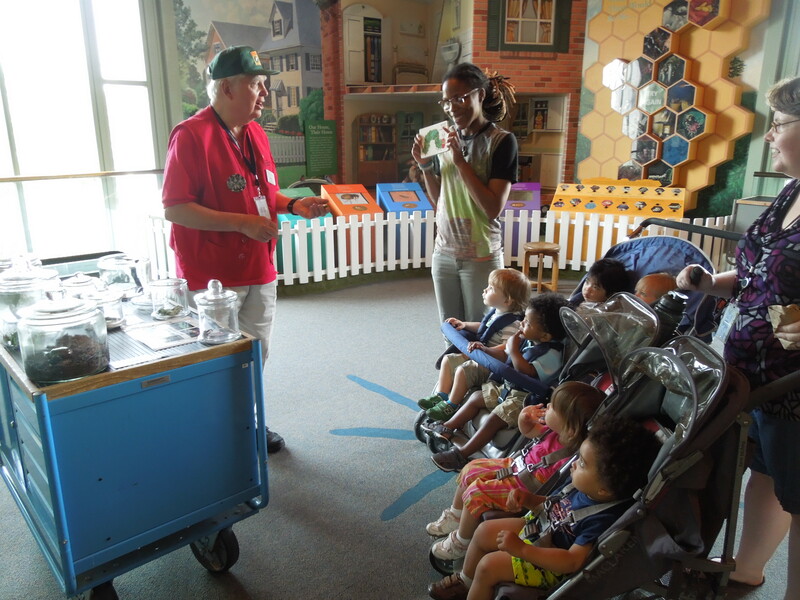 I believe the most successful parts of our lesson were the hands- on materials I brought along to the museum visit. 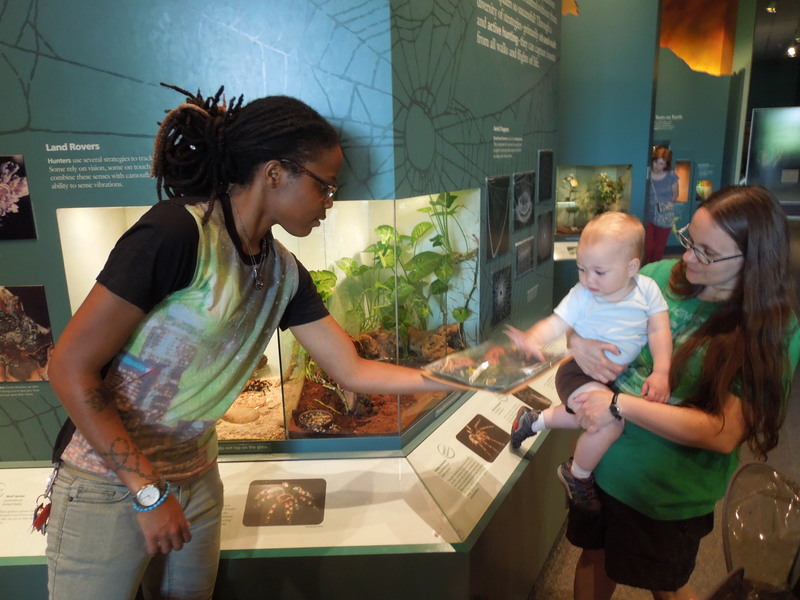 The great thing about exploring nature in the Natural History Museum is that we are able to provide the children with multiple touch points. In addition to the books and objects I brought into the gallery space, we were also able to observe real insects as well as view amazing nature photography. 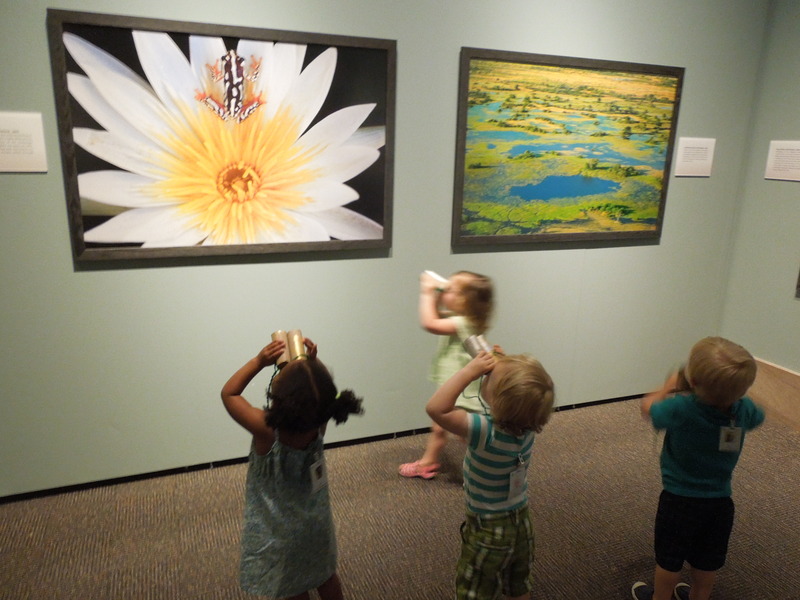 Seeing the children’s reaction to the variety of insects, objects, and images gave me a clear picture of their interest and provided inspiration for future lesson plans. I decided to spend the entire week exploring nature. While I valued the general exploration of the topic, I think ultimately, it would have been better to break down the topic, maybe focusing on just trees, flowers, or insects. I believe the focused study would have given them a greater understanding of specific topics. Also, I would recommend using as many sensory based activities and books as possible when developing a lesson. I believe the combination really helps children better understand what’s being taught. 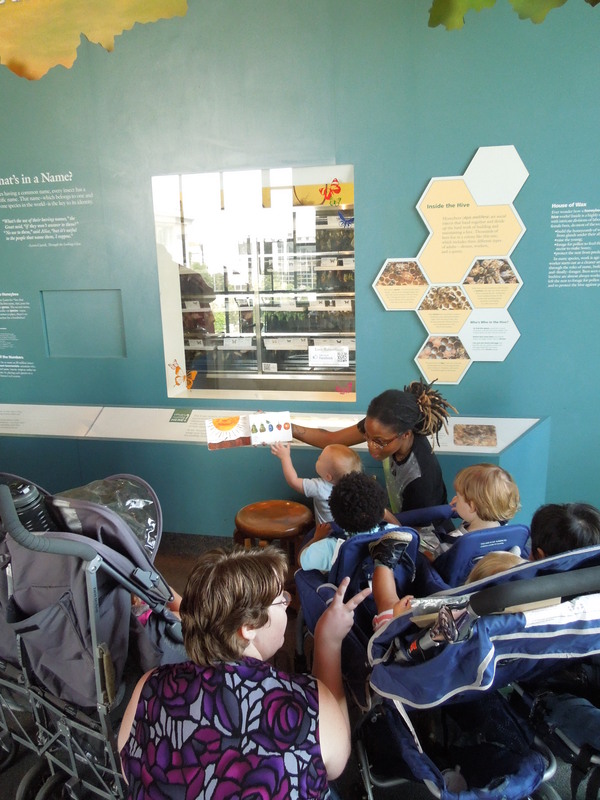 Here are a few images from their unit on nature: Brittany began by taking her group up to the Insect Hall at The National Museum of Natural History. 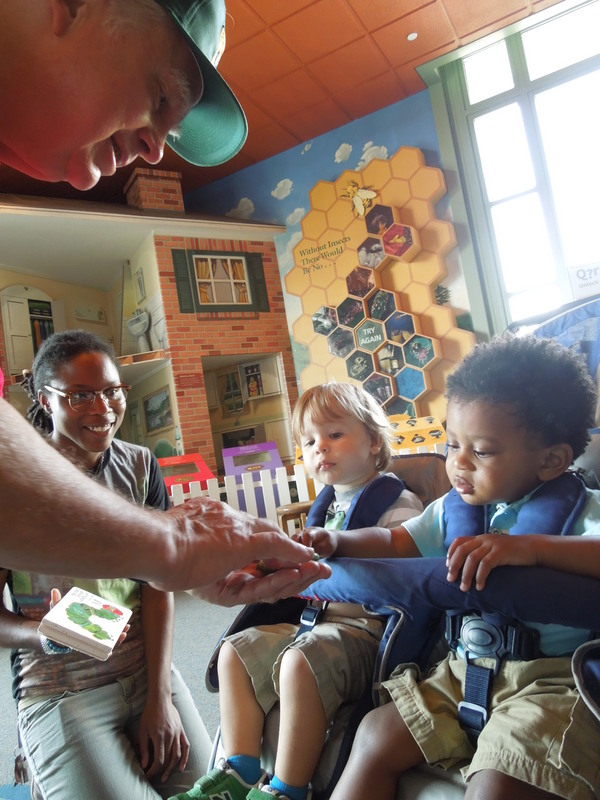 On many mornings there is an interpreter in the gallery with different insects for the children to meet. The children got to meet a live caterpillar and compare it to the Eric Carle’s The Very Hungry Caterpillar. 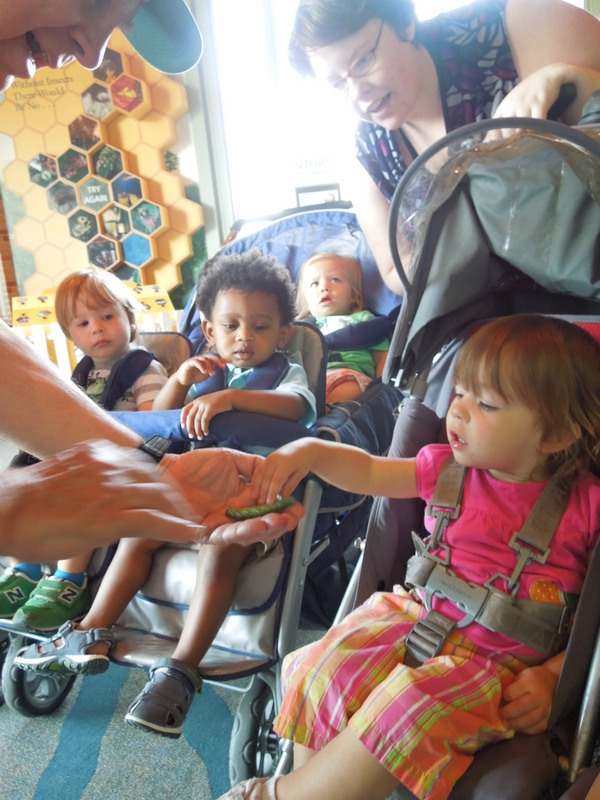 The group practiced using gentle hands and loved exploring the texture of the caterpillar. 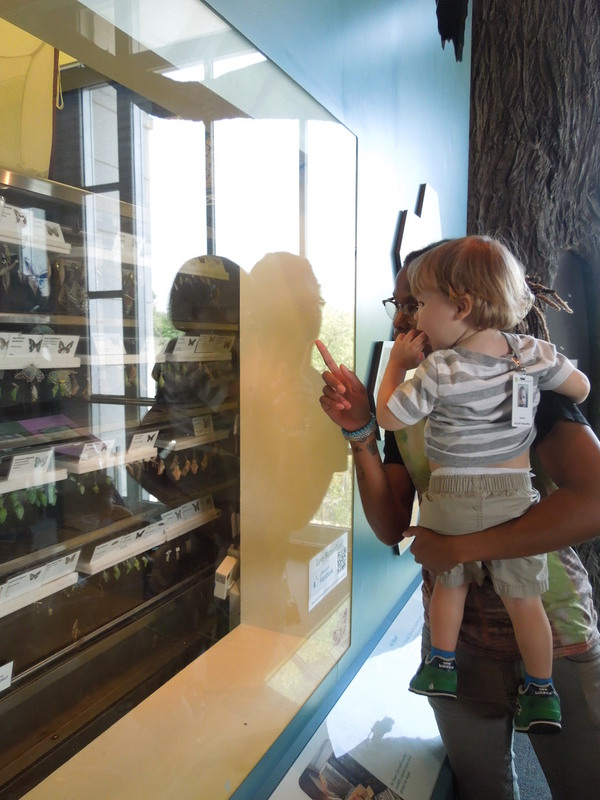 Brittany then had the group observe the display of chrysalis and butterflies. She explained that the caterpillar they just saw would eventually become a chrysalis and then a butterfly. 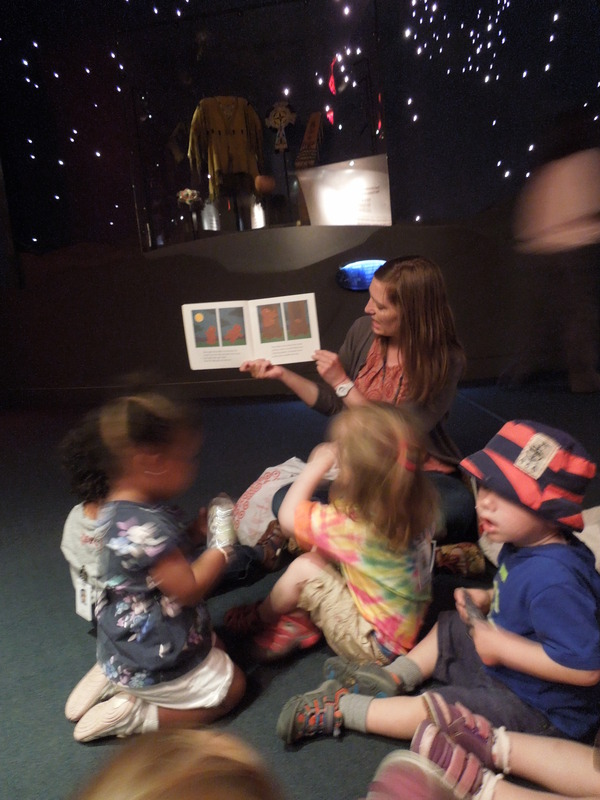 To reinforce the information she was sharing with the group, Brittany read The Very Hungry Caterpillar. 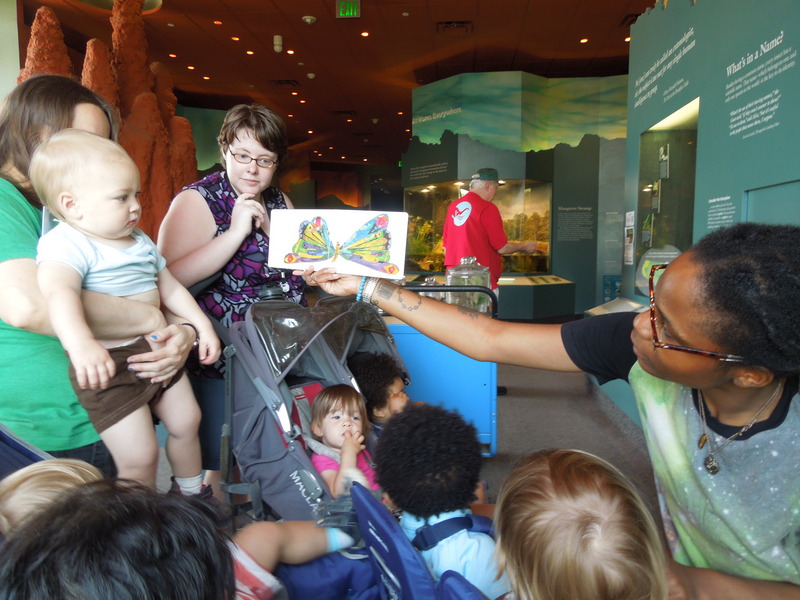 She was sure to point to the corresponding exhibits as she read. Brittany then led the group around the gallery to look at the other insects. 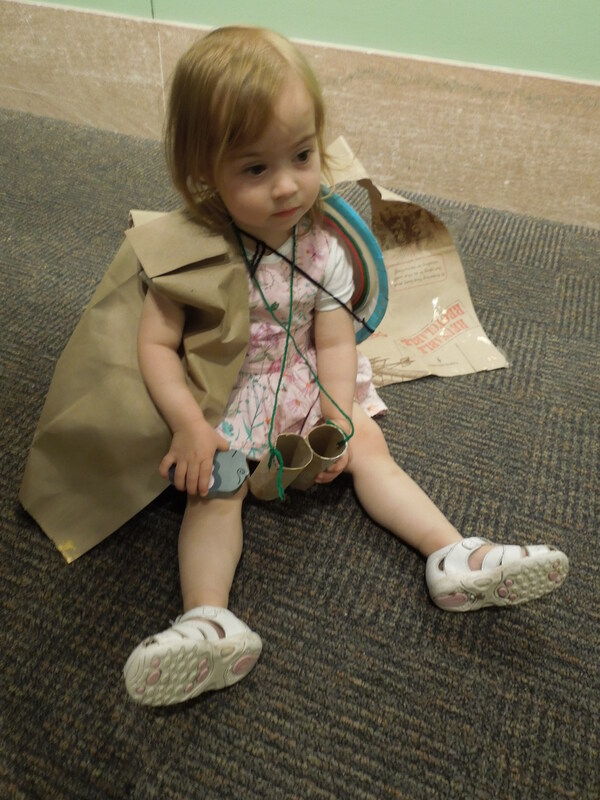 She brought along a sensory bag full of dirt, small insects, and foliage for the children to touch in the exhibit. 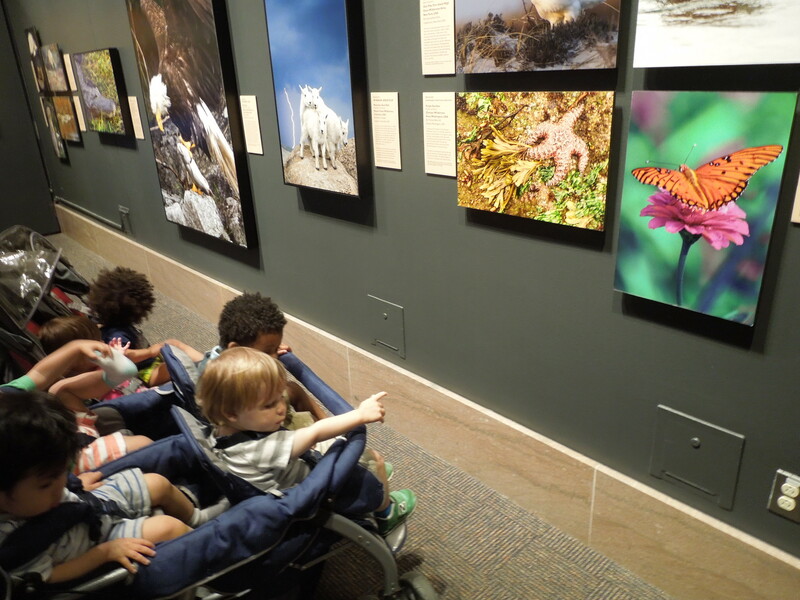 The group went up to see the Wilderness Forever: 50 Years of Protecting America’s Wild Places photography exhibit. 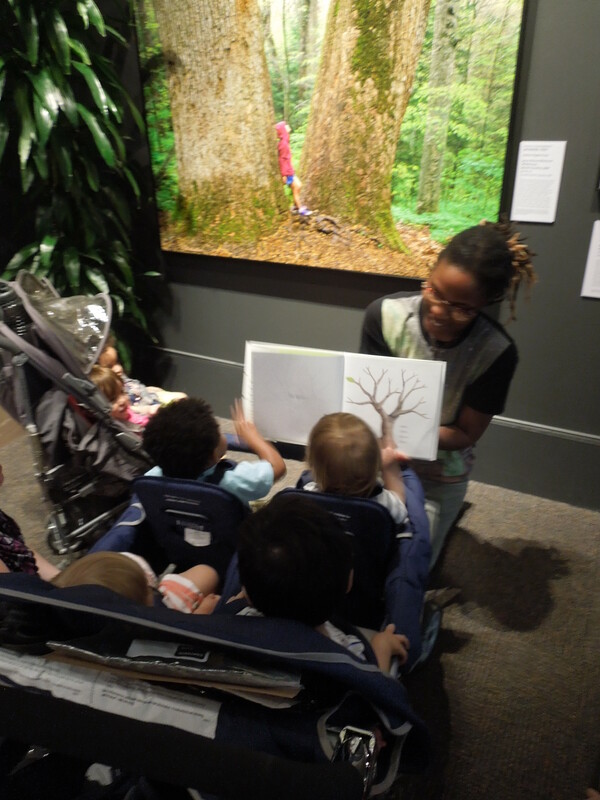 The class had fallen in love with the book Tap the Magic Tree by Christie Matheson so Brittany read the book in front of one of the photographs in the exhibit. 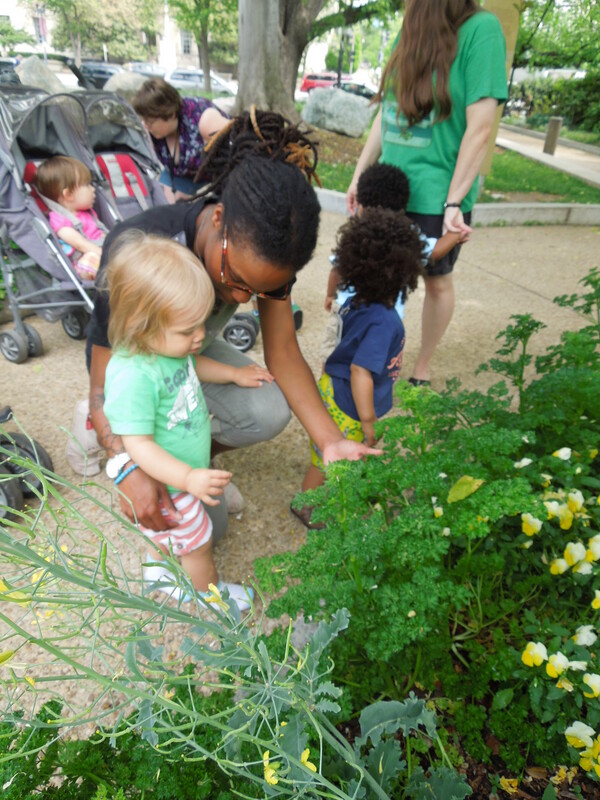 The last stop was to the edge of the Butterfly Garden (located outside of the Natural History Museum) to interact with plants and insects in their natural environment. Brittany encouraged the group to feel the textures and smell the different plants. This class had a wonderful time learning about nature! Be sure to check back for our Teacher Feature next week! This week we are featuring Melinda Bernsdorf. 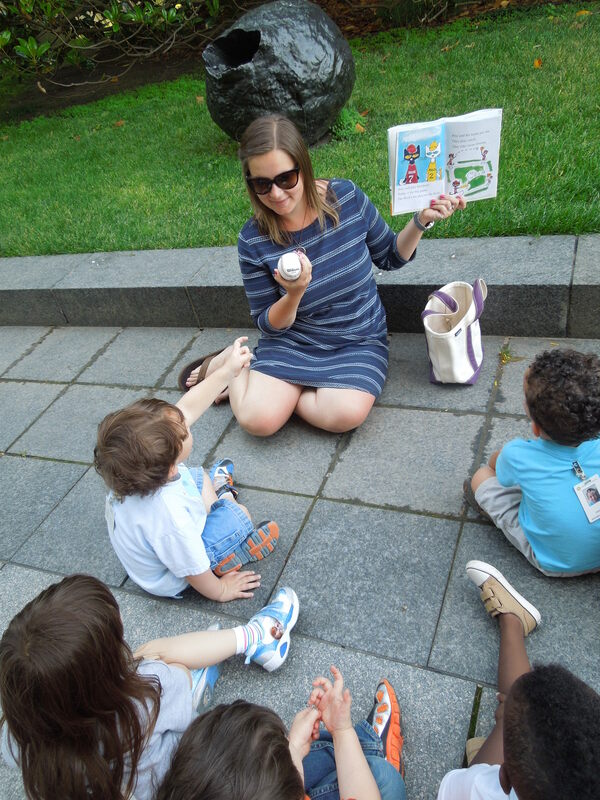 Her toddler classroom was learning about opposites and decided to spend a week learning about the sun and the moon. 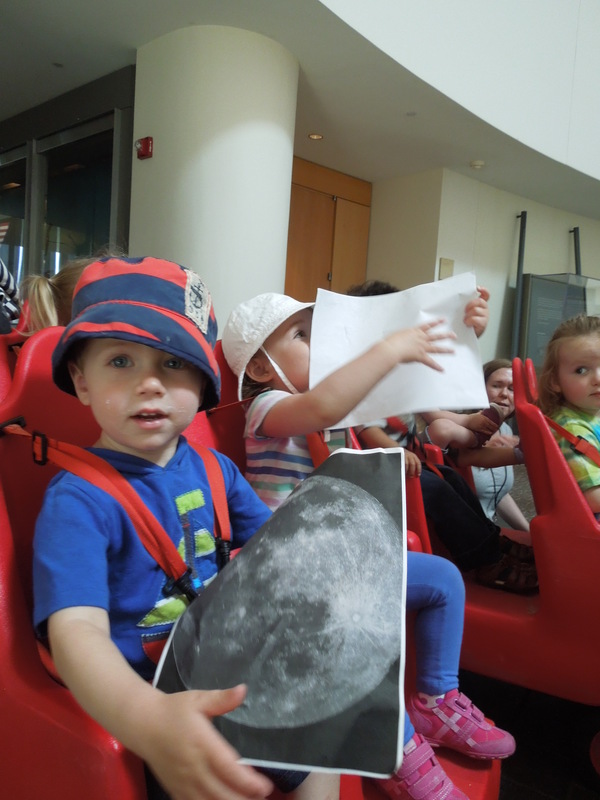 Below you will find a reflection from Melinda and images from her lesson on the moon. In our classroom, we have been talking about opposites. This week, we looked at day and night, something very familiar to the kids, and discussed the differences between these two concepts. We talked about the noticeable differences in the level of light, and the different objects we see in the sky during day and night. 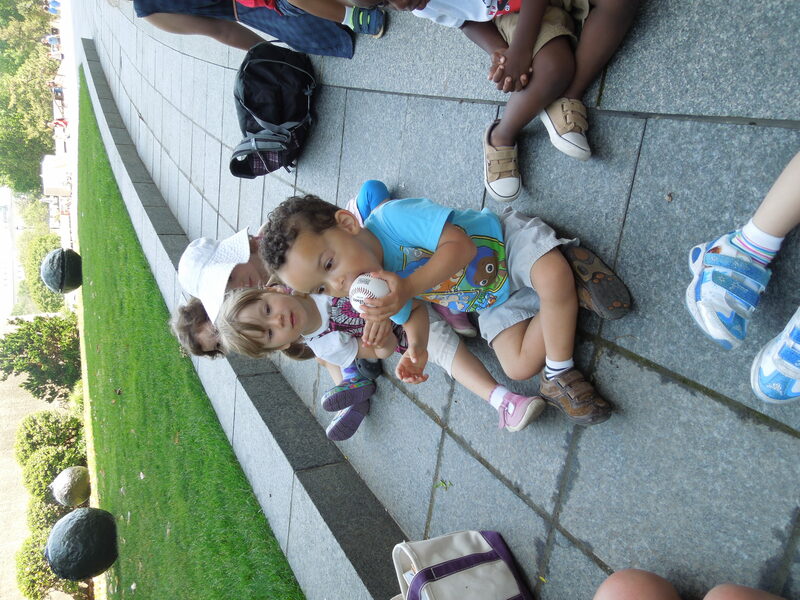 We started in the atrium of the National Museum of the American Indian. There is a large skylight that has metal work resembling a sun which lets sunlight shine into the space. There is also a set of prisms, and as the outside light shines through, rainbows move across the walls. 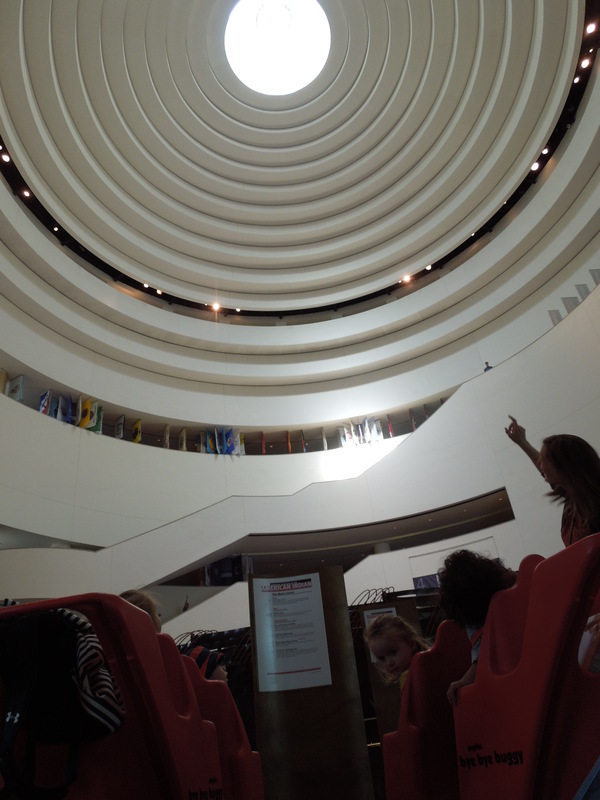 We then looked at the amazing star scape on the ceiling of Our Universes in the National Museum of the American Indian. To focus our attention, we brought “telescopes” we made earlier in the week, and found shapes in the stars. To deepen our discussion on the moon, we talked about the texture of the surface, and each child was able to imprint their own Styrofoam moon with finger shaped craters. We also talked about how our actions are different in the day and night. There was lots of discussion about sleep and play. 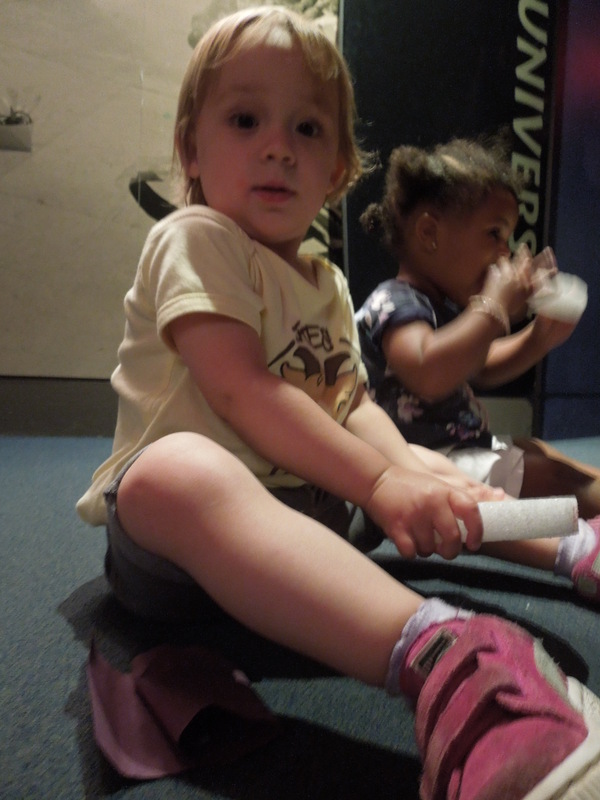 Exploring opposites is always a great way to involve our kids in scientific discovery and early math skills. I want the kids to become more familiar with the vocabulary on these subjects. We compare and contrast, and talk about observation and investigation. In this lesson, I wanted to bring the attention of the children to a more complex conversation about an everyday experience. 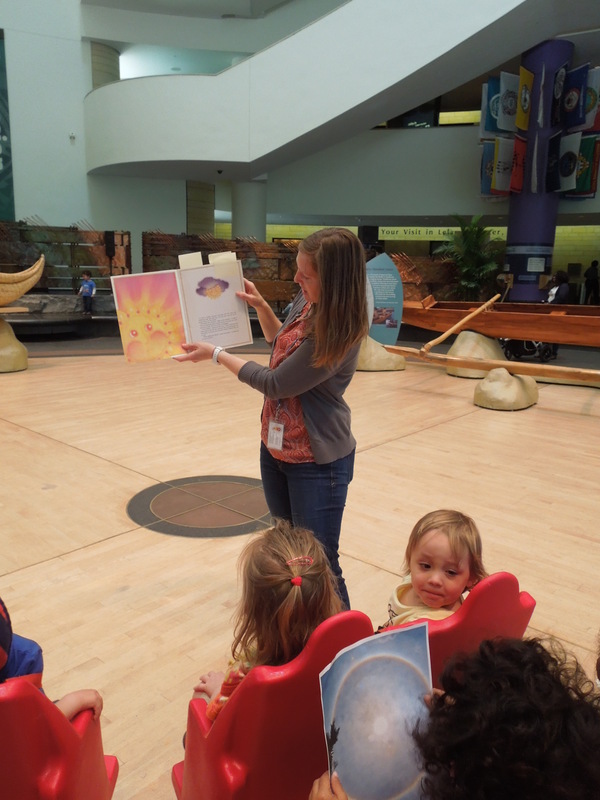 I also wanted them to have a great immersive experience, reading about the sun and brightness in the atrium where they could see it shining through the prisms, casting rainbows on the walls, as well as talking about the moon and stars while sitting with “telescopes” under a night sky. The kids really enjoyed the telescopes. They recognized their work from earlier in the week and felt a sense of ownership and pride as their art project became a tool. 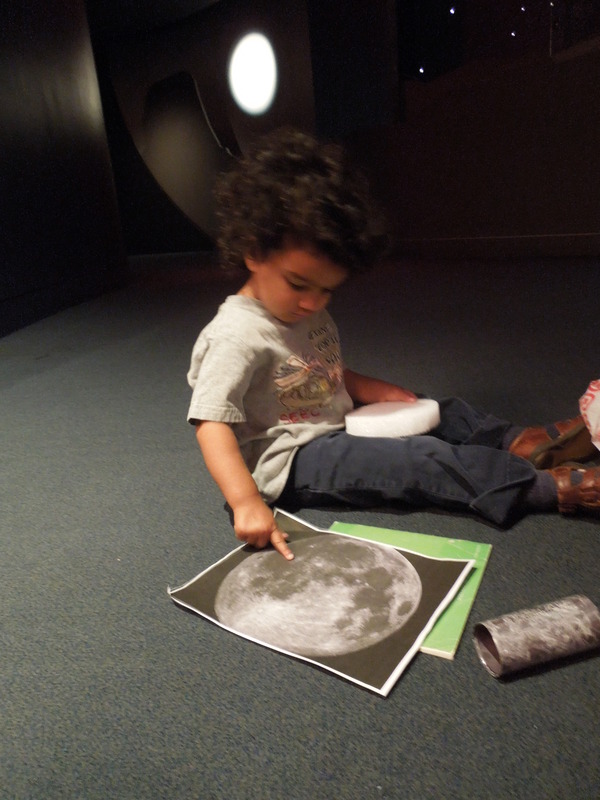 They focused on the stars and moon longer when using the telescopes, and having a tactile object that related to the lesson helped lengthen their attention span. 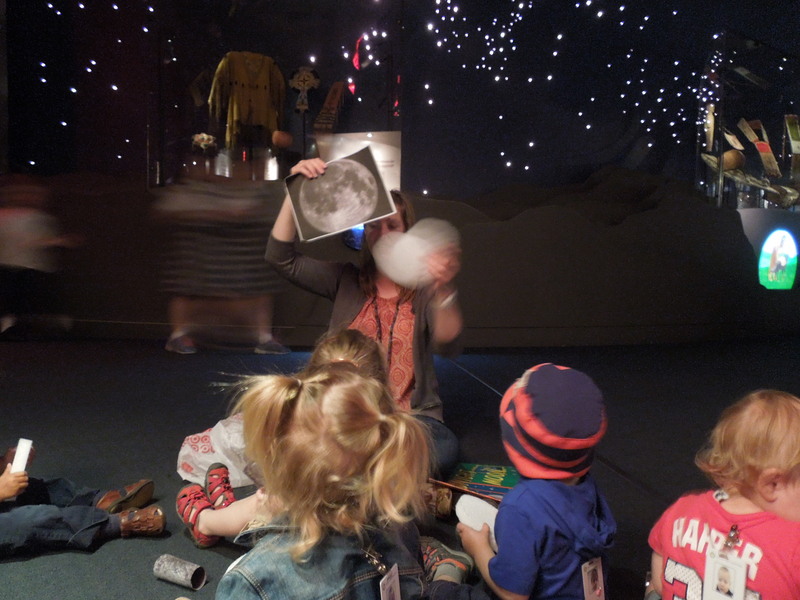 Trying to extend our lesson with the Styrofoam moon would have worked better in the classroom. 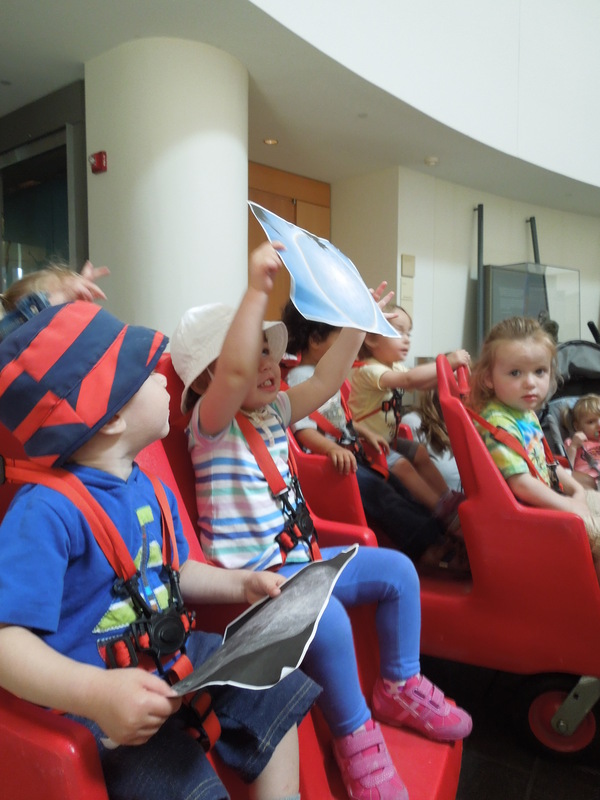 I was hoping for an art activity that would lend itself well to the museum environment, however I ended up asking toddlers to sit for too long. Between the time in the atrium and then the time under the stars, we became a bit antsy. When I attempt this lesson again, I think we might talk a little more about the moon and its surface on a different day. I would also like to expand this project by having the kids paint the newly-cratered surfaces of their Styrofoam moons with a mud or clay based liquid, and decorate the other side of the Styrofoam with orange and yellow tissue paper. This will give them a tactile object that represents both the moon and the sun. Like the telescopes, these could be made ahead, and brought with us to the museum to bring both aspects of the lesson together. 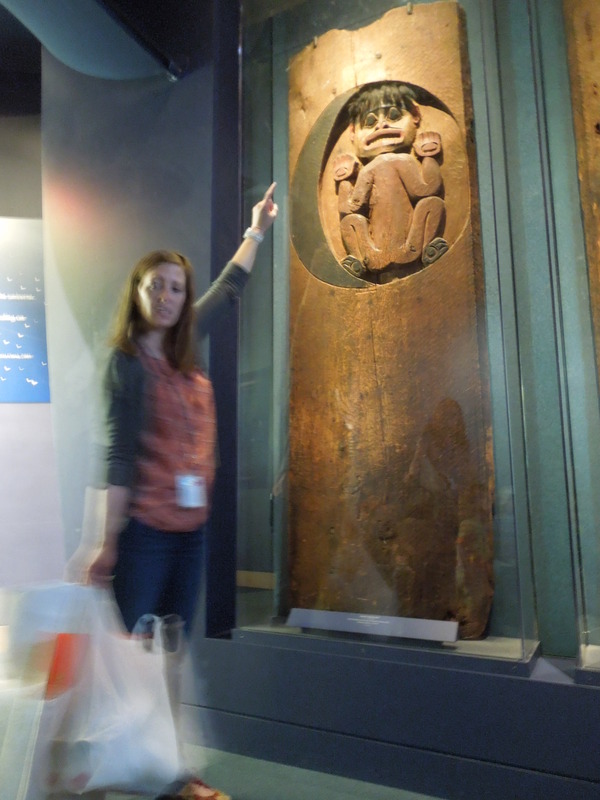 Melinda took the group straight to the National Museum of the American Indian for their lesson. 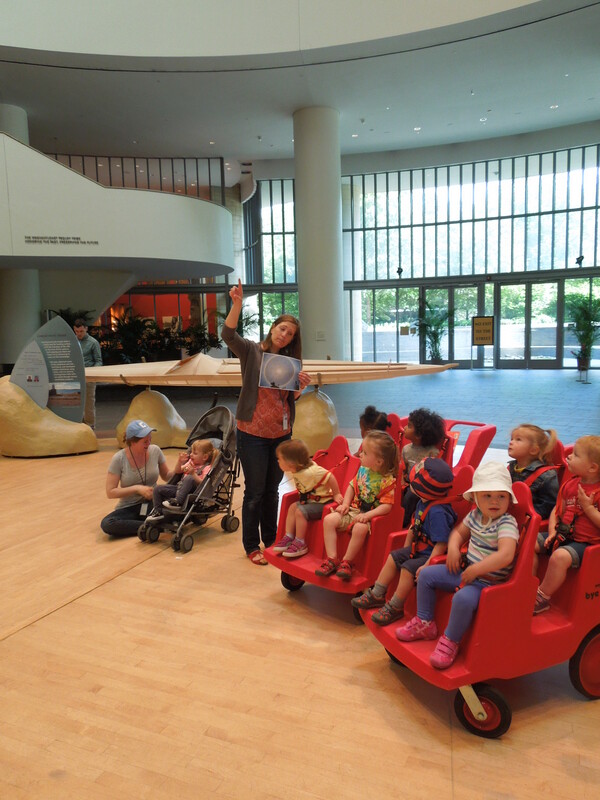 When they first pulled into the museum she had the group stop and observe the light coming from the ceiling portal. Melinda then showed the group an image of the sun and asked them to compare it to the light that was coming out of the portal. They talked about the shape and the amount of light they could see. 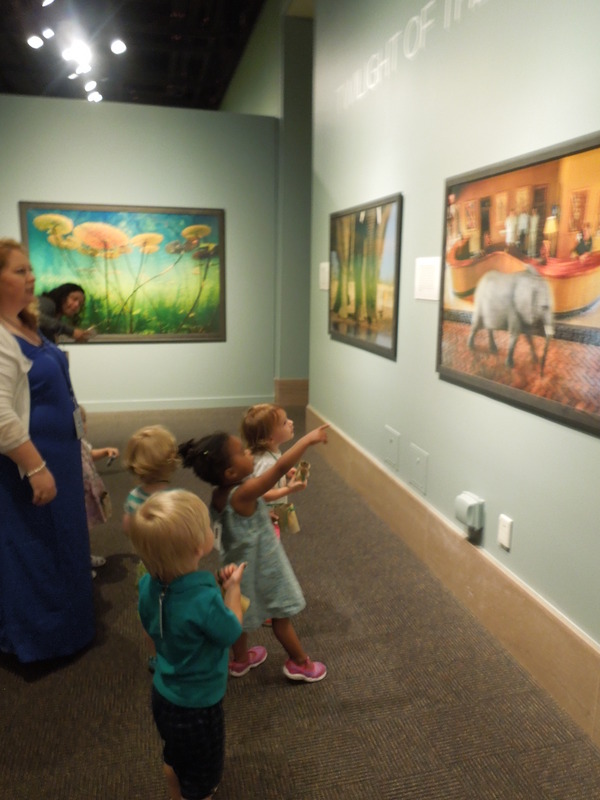 Melinda gave each child the chance to look closely at the image. She also referenced a book they had read earlier in the week about the sun. They then headed up to the Our Universes exhibit. The ceiling of the exhibit has a moon and is covered in stars. Melinda passed out telescopes that the children had made to help them look closely at the night sky. 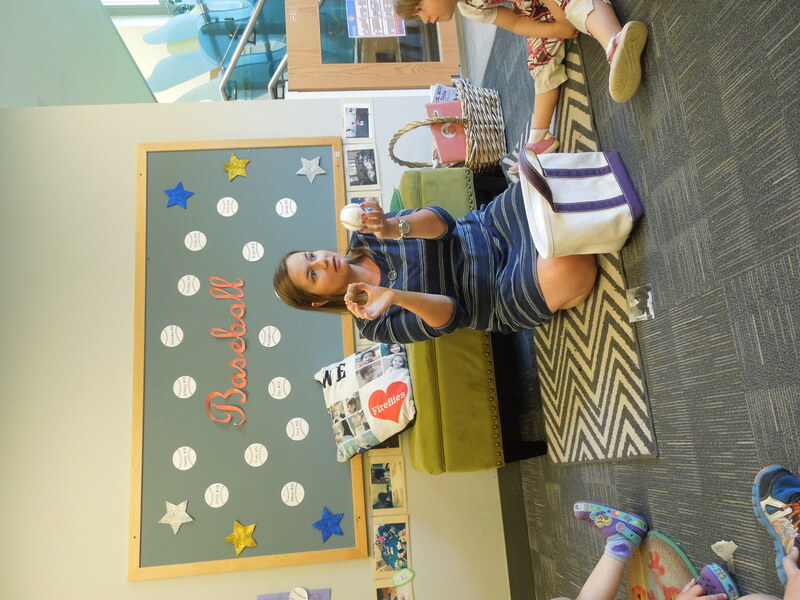 While the children were looking, Melinda read them Moon Game by Frank Asch. 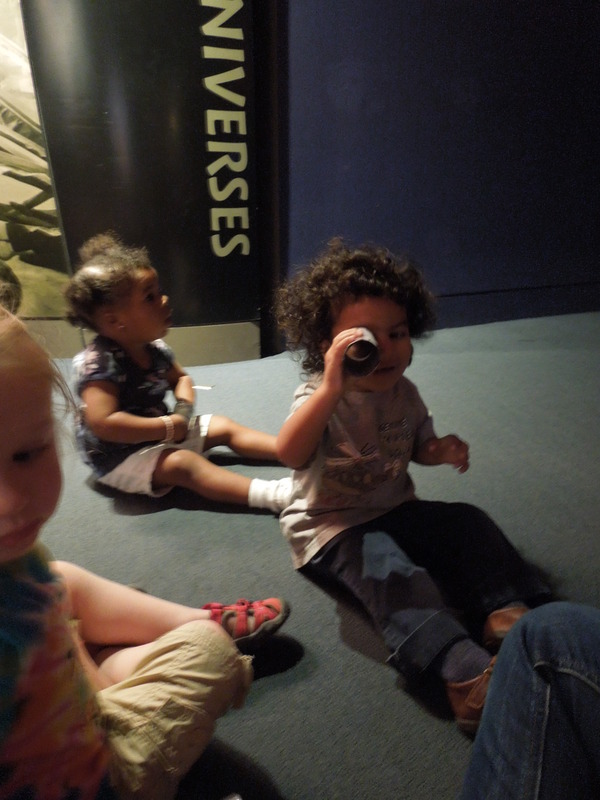 The group loved looking closely at the book through their telescopes. Melinda then shared with the group an image of the moon and styrafoam circle. She talked about how the moon is covered in craters and that they were going to use their fingers to squish the foam and make their own craters. They enjoyed the sensation of the foam squish beneath their fingers. One little girl especially liked comparing her circle to the moon. Melinda also had the group look at the House Post from the Dís hít (Moonhouse) of the Kwac’kwan Clan. She pointed out the circle shape and how the carved image on each post could reflect the different phases of the moon. They took one final look at the sun coming through the portal and compared the two images of the sun and moon before heading back to the classroom. This class had a wonderful time learning about opposites! Be sure to check back for our Teacher Feature next week! This week we are featuring Noel Ulmer, Nessa Moghadam, and Katy Martins. 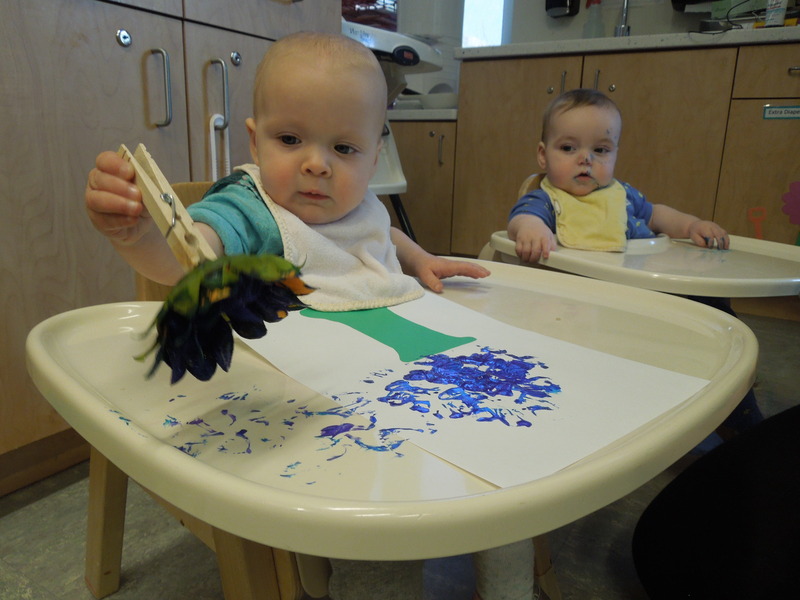 Inspired by the spring weather and blooms, their infant class decided to paint with flowers. Below you will find images from their painting experiences with flowers. Here are a few images from their unit on the flowers: Nessa began the lesson by reading Planting a Rainbow by Lois Ehlert. 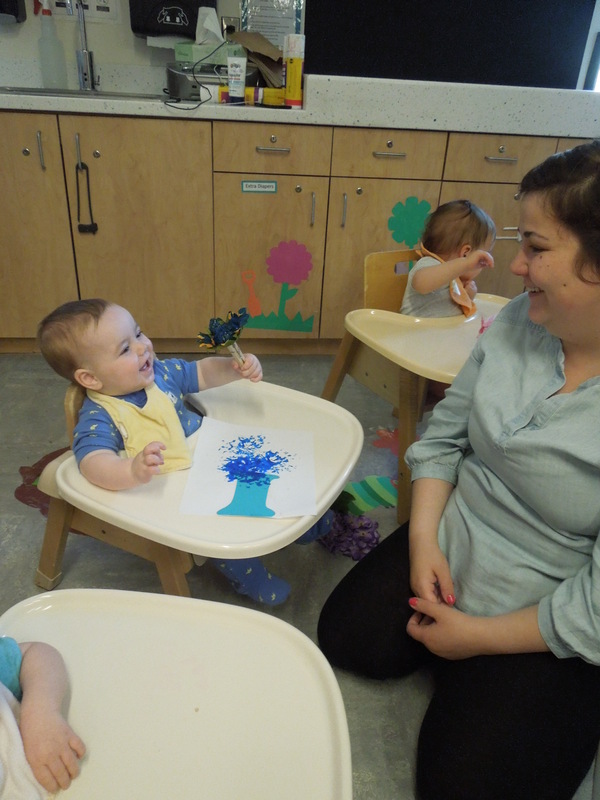 The team had the children sit in high chairs so they could have a nice flat and accessible surface to do their painting. 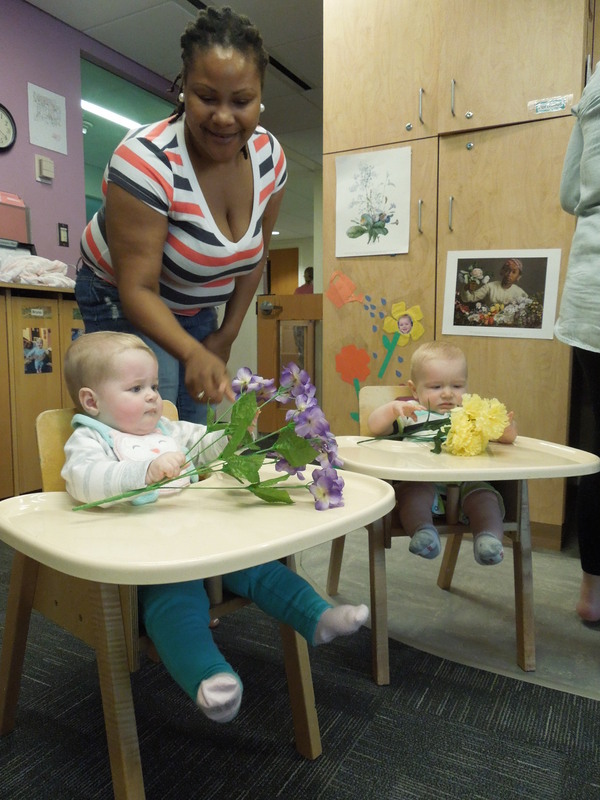 The children were first provided with silk flowers to touch and explore. 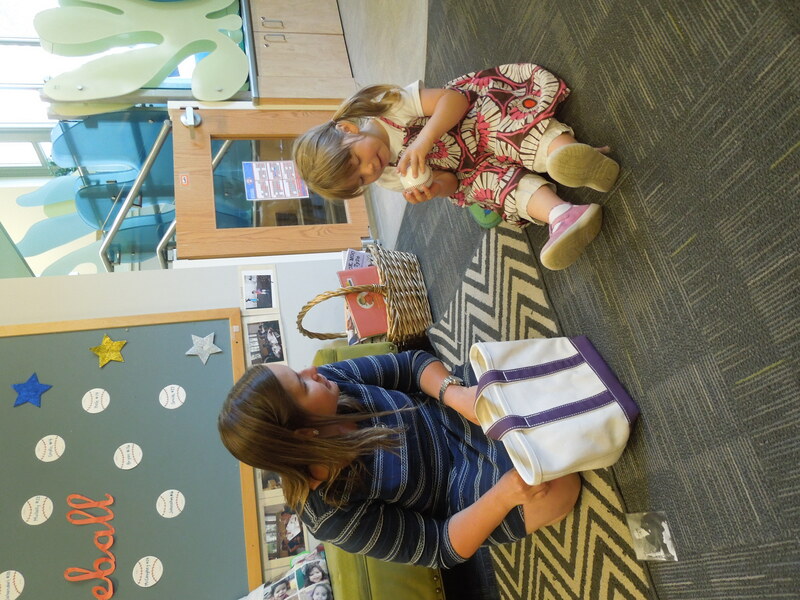 The children used all their senses! Then it was time to try out painting with the flowers. The teachers had pre-made sheets with a vase for the children to add their flower prints. The teachers added a clothes pin to the shortened stem of the silk flower so they would be able to get a better grip. 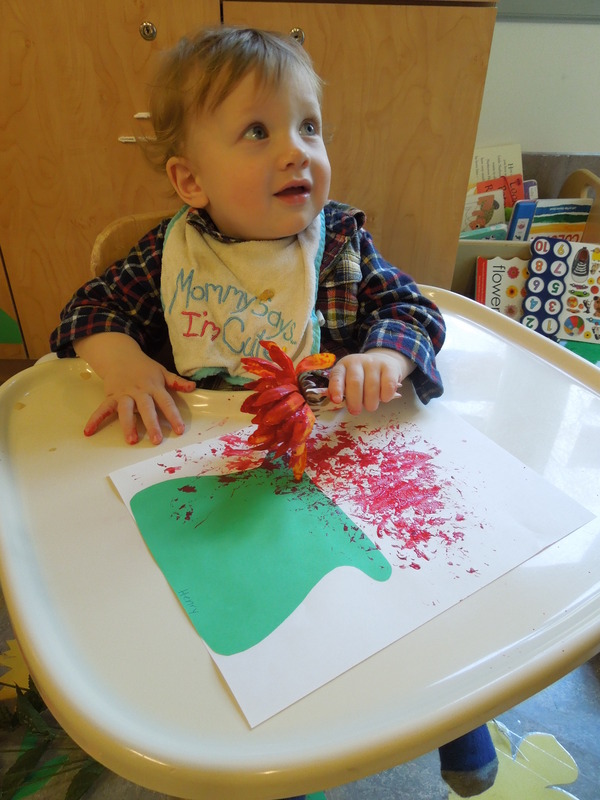 This was great activity for them to work on their fine motor skills. 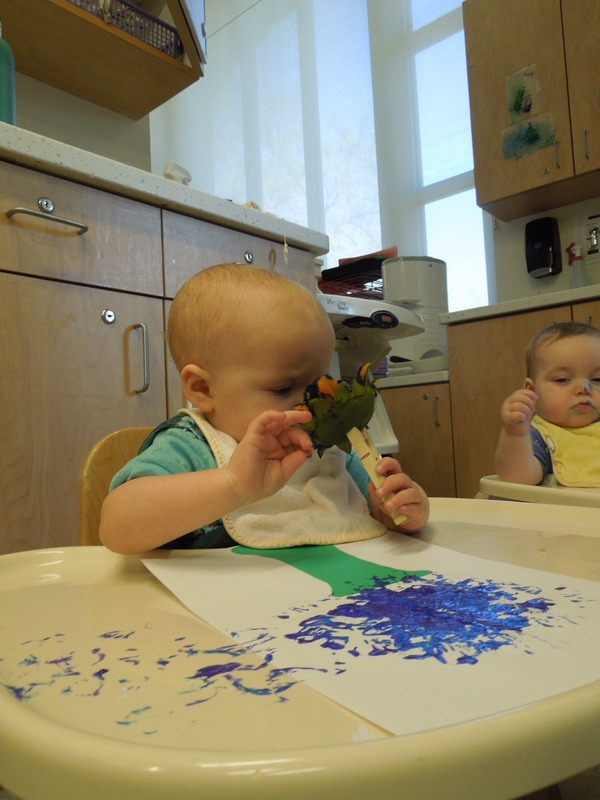 In addition, the babies began to notice that the painted blossom leaves marks where ever it lands. 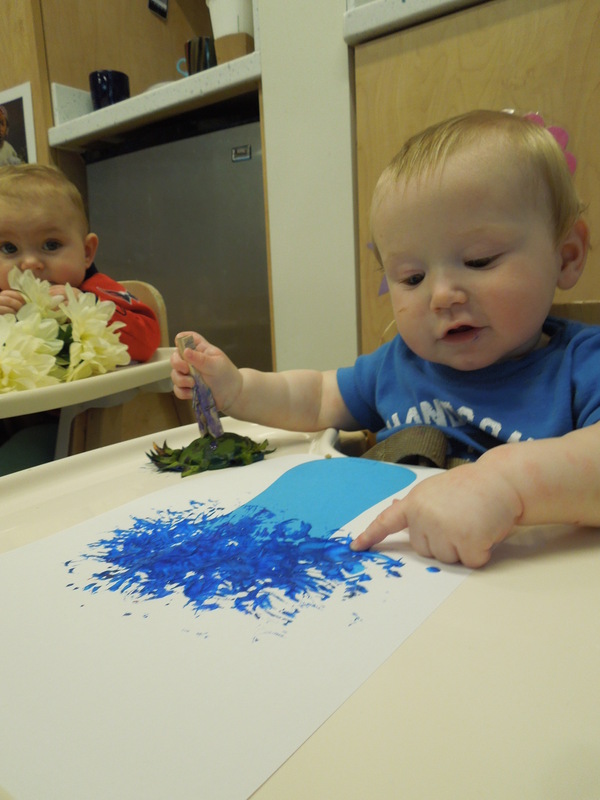 The children were interested in exploring the painted flower in many different ways, including smelling and touching the wet paint. The teachers decorated their room with images of flowers, art prints, and images of the children. 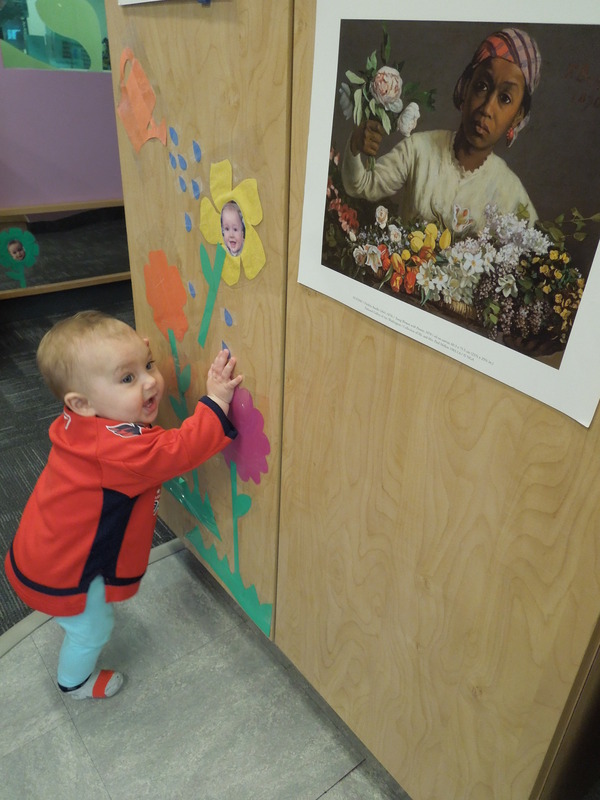 After painting, this little girl came over to check out the paper flowers on the wall. 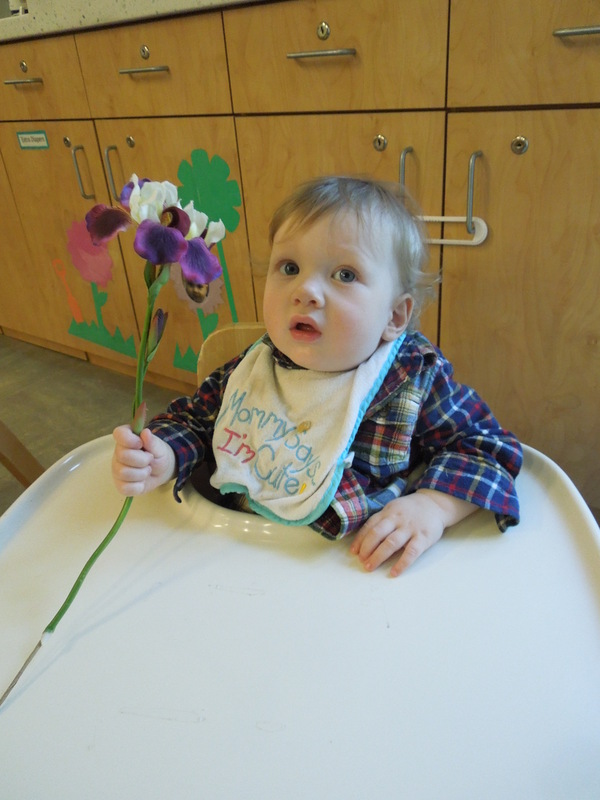 This class had a wonderful time learning about flowers! Be sure to check back for our Teacher Feature next week!